Steiner Synthasystem DIY: More panels arrive! 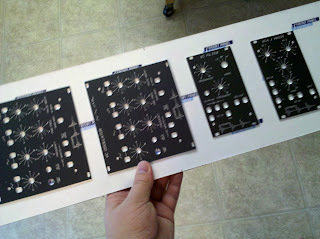 Yesterday I got the rest of the panels for this batch of modules! I've already put down all the jacks and standoffs, and everything fits just fine. I also got the panel for the rack-mounted power supply I'm setting up - more on that later. Unfortunately my order of knobs and additional heatshrink from Small Bear is MIA(?! ), so I was only able to wire up the VCF and one of the VCOs. 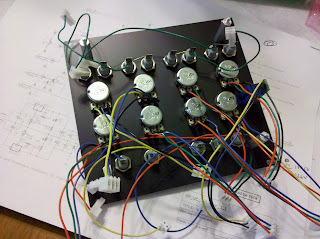 The great news is that the VCO works! I haven't done the range and V/Oct calibration, but that shouldn't be an issue, as all the other calibration went fine. I haven't tested the VCF with any input, but I verified that it does self-oscillate at high resonance, so something is definitely working! I'm going to wait until the modules are all done with knobs to post pics, but in the meantime, here's a sneak-peek at the VCO wiring. As you might imagine, I'm really thrilled with how well this project is going so far. Thanks to Nyle for his great designs, and to David for creating these PCBs, his excellent instructions, and help! In anticipation of having the VCA and the other VCO completed sometime next week, I'll be ordering a stack of new boards tomorrow!